Hi folks. I wanted to thank Johnn for the welcome-aboard message last week. I’ve been collaborating with him for about a year now and having a great time. I hope you find the newsletter, supplements, and GM Mastery forum as useful and fun as I do. A Magical Medieval Society: Western Europe has been praised like no other d20 supplement. Its content is up for three ENnies awards, including Best Setting Supplement. Pick up your copy today at www.exp.citymax.com or www.rpgmall.comand you’ll agree: it is simply the best. Most GMs use a screen at one point or another during their GMing career. These screens come in all shapes and sizes, both homemade and store bought, and are used for a variety of reasons with a multitude of game systems. The humble screen has become a permanent feature of the GM’s equipment. Most of us use our screens for the same few reasons, but there are many more uses the GM’s screen can be put to. Below is a listing of a few of these uses and how they may help a GM run his game effectively. This is the primary use of a screen and will continue to be so as long as we play using papers that need to remain hidden from the players. Screens can effectively hide adventure notes, maps, player handouts that haven’t been distributed yet, and anything else the GM needs to read or write during a game. The second of the three typical uses for a screen, obscuring various dice rolls from players, is something the screen is very good for. Hiding your rolls in this way can prevent players from knowing about secret checks that you’re making or from results you simply don’t want them to see. Some GMs actually use their screen as a dice stop so that their rolls don’t go ‘rogue’ and dash into the open. You could adopt and extend upon this idea, making players roll dice against your screen to help stop cheat-rolling. The third typical use of the screen is, of course, to carry important tables or game rules for easy reference. Combat stats, skills chances, check modifiers, equipment lists, weapons info, and spell abilities are among the many types of information shown on screens, both store-bought and homemade. Some screens use both sides for such information. If using all of the GM screen to show tables and rules, put information pertaining to the players on the outside edge of the screen. Making player-used rules and tables available to the players in this way can help speed play. Save the inside edge for GM-only information such as reward schemes, check modifiers, and creature stats. Similar to the tip above, you could use the outside edge of the screen to not just show rules and tables, but actual character information too. Current XP, hit points, stats, and skills are all great candidates for this approach. This means that players need only keep notes of clues and equipment during the game, because all of their statistical information is staring back at them from your screen. This use of the screen can get a bit messy when a group gets to be more than 5 people, and it helps if important character stats are in bold or otherwise highlighted to stand out better from the screen. It’s sometimes difficult to start a game and get everyone’s attention focused in your direction. Use your screen to get their attention by decorating it in some interesting way and changing its appearance frequently. In this way, interested or nosey players will start a session by looking your way to see what’s on your screen. Once player attention is focused, you can get them to listen to you more easily. This sounds like a crazy idea but it does actually work – I employ such a tactic myself. In my games, I put the latest gaming cartoon strips on the front of my screen so, at the beginning of the session, all of my players face me to read the strips. As they’re all chuckling, I launch into the game before their attention is diverted away from my vicinity. Screens can be decorated with just about anything, but game- themed pictures, actual game maps, and comic strips work best. Screens make great notice boards, allowing you to show things to the players temporarily without passing numerous sheets of paper around. To achieve this, use paper clips, pegs, Post-Its, or grips to hold up sheets on your screen. You can also make one of your screen panels into a dry-erase board that you can scribble on. The number of things you could display to your players is only limited by your imagination. Similar to the notice board idea, using the outside edge of your screen to display to players their present mission or quest objectives, and the progress they have made so far, can have a good effect on game flow. Having a reminder of their goals can stop players from getting mired in the ‘what do we do know?’ mindset so deadly to many campaigns. If players start to wander off-track, simply tap your screen to draw attention to their goals, and they’ll soon be blazing a trail again. Many campaigns lose track of game-time, both in the week-to- week and hour-to-hour sense. To help stop this sort of confusion, use your screen to display the current date and time in your campaign and change it accordingly during sessions. Make sure it’s viewable by you and your players, so it can serve as a rough guide to you both. To give you an example, I’ve stuck a picture of the sun to a clothes peg and sat the peg on the top edge of my screen. During the character’s day, I move the sun-peg along the top of my screen to give the players a very rough idea as to how far though the day they are. This last possible use of the screen is perhaps the most unorthodox. Cover one side of the screen with squares or hexes; when combat breaks out during the game, lay it flat and place markers and miniatures on it to conduct the battle. This approach works particularly well with combat- heavy or wargame type fantasy RPGs when the group has no access to a dedicated battlemap or not enough space to actually use one. Ingenious GMs can even use this approach while the screen is still standing, by using blu-tack, velcro, or even pairs of small magnets (one on the counter and one behind the screen) to stick counters to their battle grids. If you have any screen tips, techniques, or ideas of your own, please send ’em on in. Thanks! One item I thought to add to your article in issue #178 about post-game thoughts would be the use of a ‘comment book’. I have had an ongoing series of comment books (I’m up to volume III now) where the players and GM are asked to comment on anything they want to about the session just played. In addition, I usually ask of any GMs I play for to comment on my play actions and if there was any way I could improve on what I did in the session. More important is the reason for starting this book in the first place. 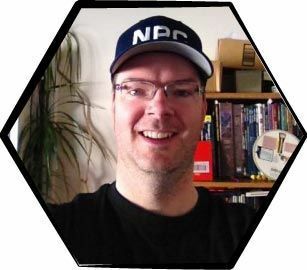 I do this as a method of ‘de-tuning’ from the RPG action, as we can become quite engrossed in character actions and do many mean and nasty things to our fellow characters; there must be some way of separating player from character. Improve my NPC characterizations and my PC actions; especially now that I am playing again – yayyy! Give a ‘vent’ for players to voice game concerns – more of the meta-gaming details. Allow players to separate player from character, and not allow in-game actions to affect friendships or friendly contact between players because of character actions. This last one is the most important reasons to have and regularly use a comment book system. Thanks for the newsletter and keep up the good work! GAME ON! I thoroughly enjoyed your article on “The Logic Death Guide to Players.” I got a good laugh and several good ideas from it, so thank you. However, I must say that I completely disagree with the strategies mentioned for dealing with rules lawyers. As far as I’m concerned, there is only one solution to the rules lawyer: zero tolerance. Let it be known that rules lawyering will not be tolerated under any circumstance. If the rules lawyer starts in during the game, out he goes. No preamble, no apologies, he was warned. This solution comes from years of personal experience dealing with rules lawyers and their groupies – yes, they have them; generally a friend who benefits from their destructive behavior as well. It’s the only thing that I’ve seen work in the long run. Using him as a resource, or trying to limit his ability to rules-lawyer (e.g. declaring no OOC talk at the table, no game books during game time, declaring GM word is law) does nothing to deter him, and often only encourages him. He needs no rule books (he’s memorized them), he will continue to speak OOC during the game, and the GM’s word is nothing more than a negotiating position to him. He believes that the only person qualified to run your game is him. The only thing that stops him is immediate ejection. This works best if punctuated by not letting him into any other game you run. Getting the word out about him to other GMs you know also tends to help them see the light. It’s a harsh stance to take, and not an easy one either (especially if it’s someone you really like when not gaming with them), but it’s really the only one that actually works. I was cruising around for graphic material to do some art when I came across this link. It illustrates, with a fair amount of detail, how much a little knowledge can turn an everyday, ordinary creature into something a lot more interesting. Take a spider, for example. In just about any game system, you’d think about these as nothing more than swarms of small nuisance insects or larger threatening vermin. A little bit of light research and reading could make your players think twice. The variety of spiders, modus operandi, and environments in which they can survive is outstanding. Now take what you read one step further and put it in a fantasy or sci-fi/alien environment. Think through the adaptations and you would be amazed what you could come up with. When planning a session and pre-determined encounters, you could add a little flavour to your game just by borrowing from and modifying the infinite variety that is mother nature. Lead by example: roleplay, or better yet, get a ‘real roleplayer’ to play with them. Tell them that they don’t have to do ‘Tabletop Acting’; no funny voices, etc. Reward them when they try. Don’t make their personalities hinder them overly much. Make sure they have some kind of persona to roleplay, but don’t dictate everything for them. Just asking a couple questions will do – they’ll have *something* to build on at least. Relax for a bit. Most new roleplayers do hack ‘n slash for a while.